You may make arrangements for purchasing any of the books/DVDs by calling the curator (315-376-7822) or e-mail info@mennoniteheritagefarm.com. 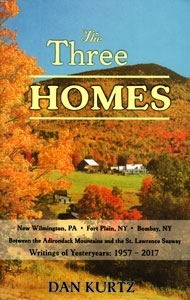 The Three Homes - by Dan D. Kurtz, Copyright 2017, Pilgrim Book Company, 99 pages, $10.00. The nonfiction book is on the writings of Yesteryears: 1957-2017 between the Adirondack Mountains and the St. Lawrence Seaway. 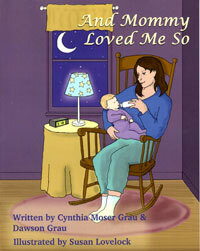 Philip and Katie Roggie Moser - by Rosanna M. Moser, Copyright 2016, 62 pages, illustrated, $12.00. The booklet is a compilation of memories for Philip and Katie Roggie Moser by their grandchildren plus genealogy. 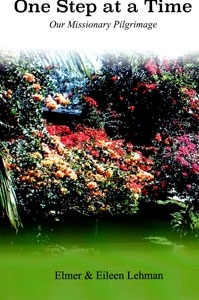 One Step at a Time - Our Missionary Pilgrimage by Elmer & Eileen Lehman, (22 years in Costa Rica), Copyright 2016, 139 pages, illustrated, $12.00. 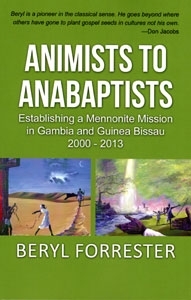 Animists to Anabaptists by Beryl Forrester, (story of the Mennonite Mission in Gambia and Guinea Bissau 2000-2013), Copyright 2015, Partnership Publications, Lititz, PA, 230 pages, illustrated, $16.00. 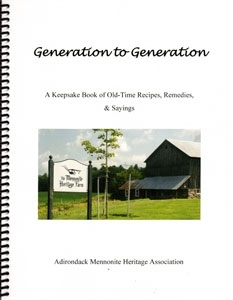 Generation to Generation compiled by Adirondack Mennonite Heritage Association, Copyright 2013, 95 pages, illustrated, $15.00. The keepsake book consists of old-time recipes, remedies, and sayings from the local Mennonite community. 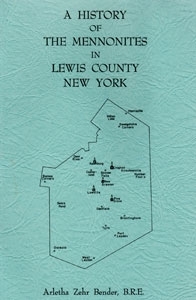 A History of the Mennonites in Lewis County New York by Arletha Zehr Bender, Lowville, NY, written in 1964, Illustrated, $5.00. This small book is the earliest history of the Mennonites in Croghan and Lowville which includes stories, sketches as told by others, and genealogies of deacons, ministers, and bishops. 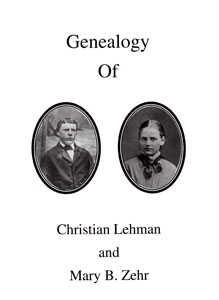 Genealogy of Christian Lehman and Mary B. Zehr compiled by Janice Lehman Crofoot, Castorland, Copyright 2013, 230 pages, illustrated, $25.00. The book contains Lehman/Zehr family history, photos, excerpts from Mary Zehr Lehman's diaries, and the genealogy of Christian and Mary Lehman. 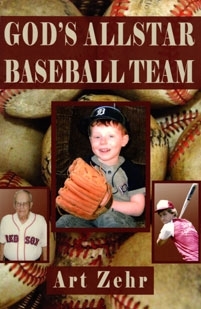 God's AllStar Baseball Team by Art Zehr of Michigan, Olive Press, Copyright 2012, 151 pages, illustrated, $16.00. Find out who the allstar players are in the Bible, what their battling line-up was, and what positions they played. Also find out how God manages His team; how He chooses, calls and commissions players; who some of His allstars are today; and what it all means for your life. 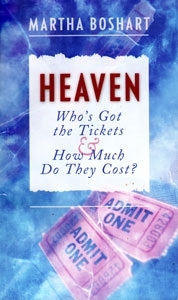 Heaven - Who's Got the Tickets and How Much Do They Cost? by Martha Boshart, Copyright 2001, 185 pages, $5.00. The book begins with a straightforward explanation of how to receive God's free gift of salvation through Jesus Christ (the only ticket to heaven) and then continues with a primer for the life that follows. 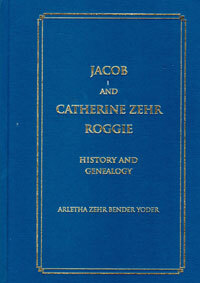 Jacob and Catherine Zehr Roggie History and Genealogy by Arletha Zehr Bender Yoder, Copyright 2015, Masthof Press, 410 pages plus index, illustrated, $30.00. The book provides history of Roggie ancestry in Switzerland followed by the descendants of Jacob and Catherine Zehr Roggie with history and genealogy for five generations. The children's names are: Barbara Roggie (m. John Martin), Anna Roggie (m. Andrew Moser), Christian M. Roggie (m. Mary Noftsier), Joseph Roggie (m. Lena and Kate Noftsier), Mary Roggie (m. Christian Moser), Magdalena Roggie (m. Daniel Moser), Jacob Z. Roggie (m. Anna Lyndaker), Catherine Roggie (m. Philip Moser), Andrew Roggie (m. Anna Widrick), John Roggie (m. Sarah Yoder), and Lydia Roggie (m. Joseph M. Zehr). 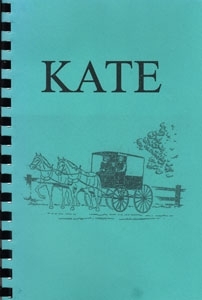 Kate by Arletha Zehr Bender Yoder, Copyright 2003, 43 pages, illustrated, $7.50. The book is a short genealogy and story of an orphan, Kate Noftsier Roggie, 1865-1947, Croghan, NY. 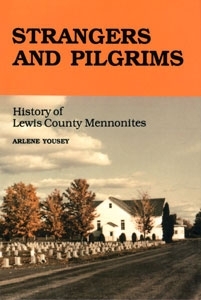 Strangers and Pilgrims: History of Lewis County Mennonites by Arlene Yousey, Croghan, NY, Copyright 1987, 511 pages, illustrated, $45.00. Arlene is a former historian of Lewis County Conservative Mennonite Churches. 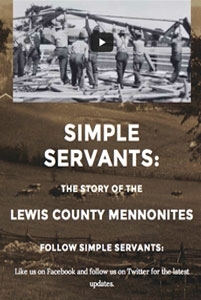 The book traces the roots of the Mennonite people from their European emigration in the 1800s to their present day activities. Town of Watson by Arletha Zehr Bender Yoder, Lowville, NY, Copyright 2014, 45 pages, illustrated, $7.00. 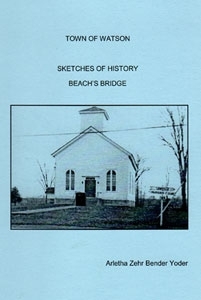 The book provides brief sketches of history in the Beaches Bridge community and its seven churches since the 1800s. 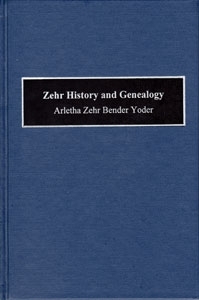 Zehr History and Genealogy by Arletha Zehr Bender Yoder, Lowville, NY, Copyright 2001, 366 pages, illustrated, $20.00. The book is about the Andrew and Catherine Springer Zehr family from France to America and Christian and Mary Yousey Zehr family in New York State. 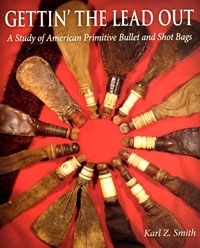 Getting the Lead Out: A Study of American Primitive Bullets and Shot Bags by Karl Z. Smith, Copyright 2011, Scurlock Publishing Co., 247 pages, illustrated, $10.00. Aaron A. Lehman, Slave Lake, Alberta, Canada, has written a number of fiction books for children and teens. They are available for purchase at any one of the following sites: Amazon, CreateSpace, www.aaronalehman.com, or aaronwl@telus.net.